Earn your degree in a flexible online format that prepares you for personal and professional success. The perfect combination to fuel your growth and open the doors of opportunity. Enjoy the convenience and flexibility of an accredited online curriculum rooted in intellectual, spiritual and personal growth. With start dates spread throughout the year, you won't have to wait to get enrolled and start working towards earning your degree. Mornings, after work, before bed, or on the weekend. With our asynchronous online programs, you can complete coursework at the time that's right for you. 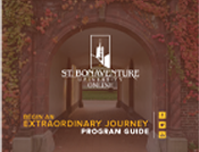 U.S. News & World Report ranked St. Bonaventure University as #1 in New York State for best value. "If you really want to deeply understand leadership and its implications on organizational growth or failure then the MSL program will provide you with a firm foundation of skills necessary to drive your organization to new heights. " Professor Heather Harris and Professor Shelley Jack discuss the online IMC graduate program offered here at SBU Online as well as answer questions from the audience. Director of Cybersecurity Hossein Sarrafzadeh shared program information about the online Masters in Cybersecurity as well as answered questions from the audience. Listen to Dr. James 'Jim' Mahar and Paul Barretta talk about how St. Bonaventure's online MBA program incorporates both finance and marketing concepts and how it can help advance your career!